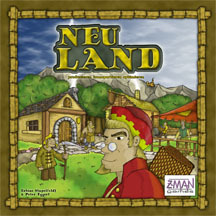 In Neuland, each player earns Victory Points by producing cultural advances. To achieve that he must join the other players in creating a civilization together, which is formed by several steps of the economic system: raw materials turn into refined materials which turn into buildings and advances. Advances symbolize the completion of chains of production, and allow the players to place their victory points on the board to win the game. Originally published a few years ago in Germany. Loaded with wood components and large tiles. The is a route planning game with a lot of substance. It requires careful planning but also feels very rewarding when you play well. Neuland is probably the deepest game I've ever played. It absolutely requires you to plan ahead to ensure that you have the right things at the right place at the right time - and it feels like a real accomplishment when you succeed. At the same time, messing with your opponents plans is also a bit part of the game, which adds a lot of uncertainty without adding randomness. A win leaves you spent but content. Once you get the hang of the rules this game becomes maybe deeper than Le Havre. It's a great game, and works well even with two.